Lucius Stewart moved to Montana to open his very own hotel, Hotel LaBelle. In 1905 he finally paid the bank in full and got the deed to his property. Lucius was in love with a Crow woman, Mourning Dove who he married in the Crow tradition, a horse and a rifle but he wanted to marry her in his hotel and have her live with him. She was carrying his child and in her tradition the man moved into the wife’s home but as much as he loved her he loved his hotel more. That very day that he finally got his deed he had a visit from Mourning Dove’s mother, Beautiful Blackfeather a Medicine Woman and from her appearance he knew immediately that his wife and child were dead. Blaming Lucius for her loss she cursed him to live in limbo, not dead and not alive until he found love. For over one hundred years he has lived in limbo until the arrival of Tallulah Thompson. Tallulah is a hotel inspector hired by the Hotel LaBelle’s new owner Will Wellington. Will needed her to save his hotel and she and her partner, Fanny a pug were all set for the job. It wasn’t until she met Lucius that things changed. Tallulah always had the gift of second sight but it was a gift that her grandmother a Choctaw Medicine Woman made her promise to keep a secret. 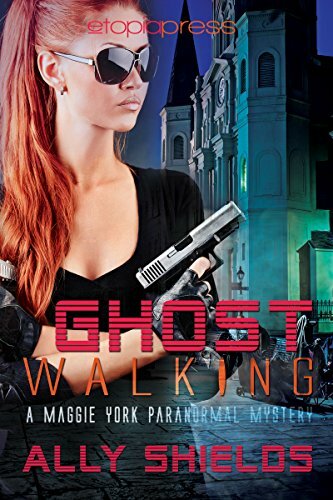 She realizes that Lucius is not dead and she can’t help her immediate attraction to a ghost like form. Will turns out to be the total opposite of what she thought. He is not on the up and up and apparently whatever money he had to fix the hotel went to gambling. She wants to help Lucius get free of the curse and it takes the help of Emma the hotel cleaning woman and her family to bring that about. She dreams about what it would be like to be able to hold and make love to Lucius and when she realizes that she can touch him she makes her desires known to him. Coming from another generation Lucius’ reaction is to turn away from her and call her a wanton women. So much for Tallulah’s dream. Tallulah is also shocked to discover that Lucius was married and she realizes that even if did should did make love to him he has not gotten over Mourning Dove, there is no way she can compete with a ghost. It is Emma and her brother Bert Blackfeather who works for Homeland Security that aid in freeing Lucius free but not for long. There is a fire at the hotel, Will is seriously injured and as soon as Lucius takes solid form he is arrested. Lucius is assumed to be the guilty party responsible for Will’s injuries and for the fire that almost destroyed the hotel. A hundred years in limbo and now in prison things are not looking up for him, in addition to losing Tallulah before he even got her. I loved this story, the characters were wonderful and there were surprises and secrets.